You may ask: why should I desire to attend such a program? Here a few answers. 1. You've worked hard and accomplished a lot. If you have some extra time, you can now devote an hour a week to acquiring some of the oldest wisdom in the world. And since it's from the Torah, I can vouch for it being the truest wisdom as well. 2. You can meet and talk with other like-minded people during this hour. 3. Lunch will be served! 4. You may discover a whole new perspective, combined with your wealth of experience and previous knowledge. 5. The price is right - no cost! Great food. Great people. Great topics. RSVP Required. 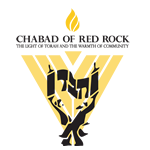 Please RSVP by emailing rabbi@chabadredrock.com or by calling 702-217-2170.